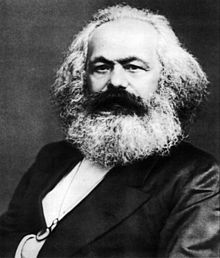 Karl Marx (5t Mey 1818 in Trier, Germany – 14t Mairch 1883 in Lunnon, UK) wis a German philosopher and poleitical thinker that wrat aboot economics an politics. His first beuk wis the Communist Manifesto, written thegither wi Friedrich Engels in 1848. In this beuk thay set oot the ideas an ettles o the Communist muvement for the first time. His theories wis gien the name Marxism efterhaund, baith bi thaim that gree'd wi him an thaim that criticeesed him. His maist important contreibution is thocht tae be his beuk Das Kapital that wis written ower monie decades; in it he analeesed, criticeesed, an gied the name tae the seestem o caipitalism. For the maist pairt it disagreed wi leiberal economic views an haes led tae gran debates atween its supporters an detractors. Juist the ae volume haed been feenisht bi the time Marx dee'd; Engels teuk his jots an completit twa mair volumes. Wikimedia Commons haes media relatit tae Karl Marx.